Spring Cleaning SNOMOMS Style! – Everything Your Mama Made & More! It seems like every time I start to clean my sewing room & want to sew SOMETHING comes up. I started the SM stash game… that went really far this time… I think I had 16 points or so vs the over 1000pts I had last winter. Well when I got prego with the twins I joined the local twins club SNOMOMS (just north of Seattle, WA). One of the best benefits is that I get to participate in the club sale that is open to the public. 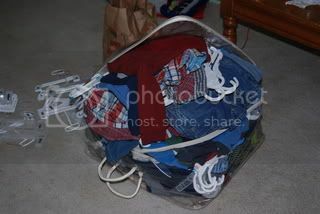 It is a GREAT way to get rid of all the stuff my kiddos have outgrown. It’s only 3.5 hrs and people line up way before it starts but I have gotten some great deals as a shopper even before I had twins. 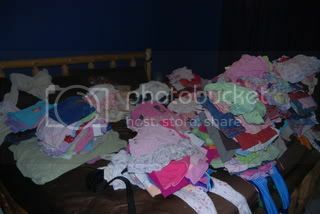 Plus I get to keep a percentage of what I sell & I can use it to get them new stuff & buy fabric to make them stuff :). If you are near the Seattle area it is totally worth checking out if you have young kiddos! It’s this Saturday March 7th from 8:30am-12pm only. The details can be found on the sale page of the club website www.snomoms.org/sale. Well the twins have outgrown 3 sizes since the last spring sale & Zander has out grown 1 so I have a LOT of stuff to get rid of. 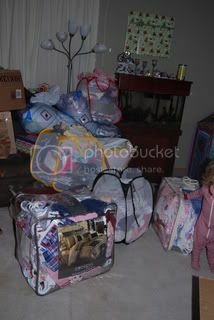 Last sale I sold everything but 1 big tub of clothes & I brought a LOT. Anyways for the last week I have been dreaming about sewing but instead I have started my spring cleaning SNOMOMS style… this always seems to get me into the mood to get the rest of the house done… & since my sewing room is next on the list I am excited. 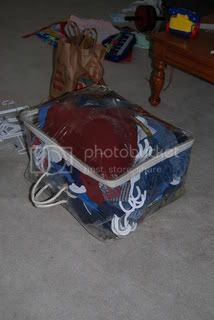 Anyways did you know that you can stack clothes ON HANGERS twice as high as a comforter bag & still get it zipped? I have found they are great for transporting everything. I was so proud I had to share some pictures! A few sitting on’s & careful zipping & ready to go! Off to finish pricing some stuff so I can start packing the Suburban! Hey Kymy, how did the snomom sale go? Hope you sold your lot and picked up some great bargains. I just realised the time difference (I’m in Australia) means you haven’t actually had the sale yet. So good luck, hope it all goes well.